STEM is the current educational buzzword among math and science educators. The acronym stands for Science-Technology-Engineering and Mathematics. It’s an attempt to integrate the four disciplines with the goal of attracting more students into studies that lead to jobs in the booming tech industry. Educators that focus on the K–12 grades work within a longstanding tradition for mathematics and science but there is very little widespread agreement as to what constitutes the content of K–12 technology and no agreement as to which branches of engineering are appropriate for K–12 students to study. Educators have not identified the core concepts for the various branches of engineering. What does the electrical engineer know and do that makes it different from aeronautical engineering? To answer this question for myself I decided to research Civil Engineering because students are natural ‘builders’ as evidenced by their love of Legos and other construction sets. I shared this view in three earlier posts. The found out that the core of civil engineering is made up of five 'construction' forces and six 'structural' elements. I soon realized that the forces and structural elements could be taught to grades 4–12 by having them build and analyze a few simple structures. For example, a bridge. One of the six structural elements is called a truss. A truss is subjected to two of the five construction forces, compression and tension. Let's build a truss bridge and then, in later posts, identify the compression and tension forces in a simple truss. Hopefully the building process will stimulate kids to learn the engineering concepts. I designed a set of bridge components I call 'connectors'. The connectors set the angles for the plastic straws that represent the beams of the bridge. In the diagram shown below, the connectors (printed on card stock) are shown in the proper positions to build one of the two truss needed for the bridge. A measured section of plastic straw is slipped over one end of the connector and then fastened to the other connector using a short section of card stock and white glue. A finished truss is shown below. The truss is amazingly strong. Slip the hook of a metal coat hanger through the hole in the top center of the truss. Pull on the connector directly below the hook until the arms of the coat hanger begin to bend. You will 'feel' the strength of the truss as you pull. 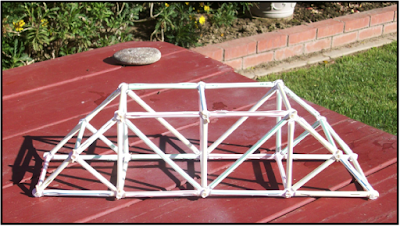 Make a second truss, use plastic straws to connect the two trusses together and you have the Warren Through Truss bridge as shown in the picture at the top of the post. All of the patterns for the connectors, instructions, and a bit of history of the Warren Truss can be obtained without cost to you by sending an email request to grandadscience@gmail.com. Once I receive your request I will email you the materials in the form of PDF files. This is an excellent project for any parent, grandparent, or other adult to do with kids. Sometimes it helps to have an extra pair of hands.